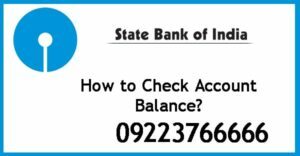 Home Banking How to Check SBI Account balance? Many people who have an SBI account use ATM or update passbook to check account balance and get the details of their account balance and transaction done. Some use a bank account statement form to get the transaction details and balance inquiry. SBI being the best bank service provider provides their customer with a variety of options to check their account balance other than the above-mentioned methods. SBI provides Account Balance check by following ways. State Bank of India is India’s largest public sector commercial bank. The foundation of SBI was laid over two centuries ago when the Bank of Calcutta, Bank of Madras and Bank of Bombay was merged to form “Imperial Bank of India” which was named State Bank of India in 1955. The success of SBI in completing the needs of their customer lies in their desire to change and improve in the use of the new age technology. SBI provides one the best customer experience by the use of many different ways. SBI Missed Call Number is free service provided by the bank for the convince of the people. This number can be used to check SBI account balance by giving a missed call and get a notification on your registered mobile number. You can use the service by Just giving a call on SBI Missed Call Number-09223766666, your call will get disconnected after a few rings after that you will get an SMS with the updated account balance. Please note this service could be availed only by the mobile number registered with the SBI account. You can check the account balance of your SBI Account by sending an SMS to the following number in a format mentioned below. Send an SMS to 5676791. How To Register your Mobile Number with SBI? It is mandatory for the Customers to register your mobile number with the bank as per the RBI guidelines. At the time of opening the account, it is mandatory to mention the mobile number. However, you have to activate the service you need on your mobile number. You can register your Mobile Number by sending an SMS “REG<space>Account Number” to 9223440000. SBI Provides a variety of banking apps for different purposes but the common things which all of these apps provides are account balance check. SBI Quick Mobile App is free and can be downloaded from the app store app. This app does not require any internet connection it works on via SMS or missed call. You Have to Register your mobile number with the SBI Bank Branch to avail this service. SBI through their internet services provides a net banking facility with many other features. You Can Check SBI Account Balance By Login To SBI Net Banking. To use this service you have to Register your account for Net Banking. For Registering your account you need to contact the bank branch. If you are using SBI Debit Card for the first time, you can Generate SBI ATM Pin at SBI ATM and then check the account balance at any bank ATM. What is the Minimum Account Maintenance Balance for SBI Savings Bank Account? SBI has a different minimum balance and it depends on the geographical area. The minimum account balance is an amount that a bank requests their customers to maintain. Failing in the maintenance of the balance will cause the bank to impose a penalty on the account holder. Is it necessary to Register Mobile Number with the Bank? Yes, as per the RBI guideline it is made mandatory by all the banks to have the mobile number registered with the account. Is SBI Quick App similar to the SBI Anywhere app? NO, SBI Quick app is different form SBI anywhere app as you cannot use the Quick app to do the banking transaction, it is only for mobile banking services whereas you can use SBI Anywhere for all the banking operations. Can I use SBI Quick app for multiple SBI accounts? No, SBI Quick is a Mobile Banking app and one registered mobile number can only be used with a single account. If you have multiple accounts with the same bank then you have to unregister your account and re-register the account. Apart from balance check what else we can do with BHIM UPI App? How to Calculate the Minimum Maintenance Balance? The easiest way of finding the bank account balance is using the SBI Missed Call Number which can be used anywhere.